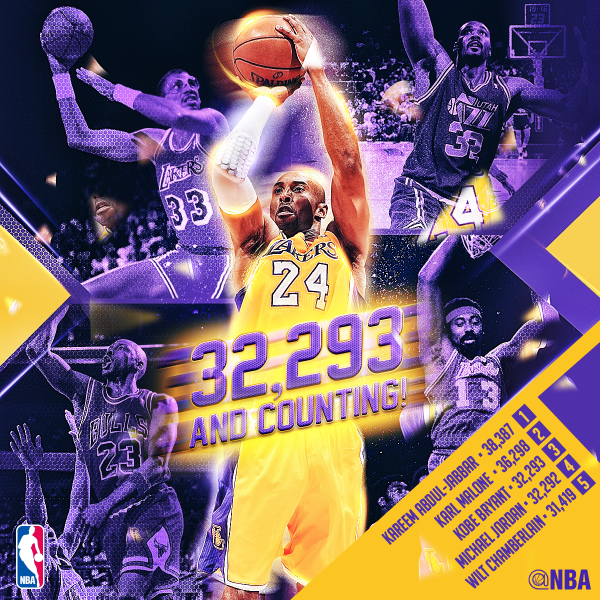 Finally Kobe Bryant surpassed Michael Jordan on the all-time scoring list. During their game against the Minnesota Timberwolves, Kobe Bryant, take a 2 pair of free throws to tied and surpass Michael Jordan. Bryant is now currently placed number 3, in the all time scoring list and moves down Michael Jordan at number 4 in all time scoring list. Kobe Bryant, trailing two more NBA superstars, Karl Malone which placed at number 2 and Kareem Abdul-Jabar at number 1 in all time scoring list. Bryant, received a round of applause in the home court of Minnesota Timberwolves, congratulating him by his team mates and some players of the Minnesota timberwolves. At the start of the game between Minnesota and Lakers, Kobe was just shooting 1 out of 5 in the first quarter but on the second quarter, he began to take shot and became aggressive as he take the memorable two free throws that makes in his career history at 5:24 to go in the second quarter to surpassed the greatest ever played the game Michael Jordan. Kobe Bryant finished the game with 26 points on 7-for-20 shooting, should it be the Indications that Bryant will retire when his contract expires at the end of the next season, at his 20th year in the league. But no matter what happens down the line whether he retired or not? , Bryant now reigns as the most prolific scoring guard in NBA history, having passed to Michael Jordan, the guy he’ll forever be compared to. It’s a tribute to his talent, his drive, his work ethic, motivation and his longevity. # 24 has surpassed # 23 to become No. 3 in All Time Scoring List. No Comment to " Kobe Bryant Moves At # 3 In All Time Scoring List, Surpassed Michael Jordan "